E’ stato liberato nelle ultime ore l’imprenditore turco rapito a Beirut circa un mese fa da milizie vicine al movimento sciita Hezbollah. Mentre è ancora incerta la sorte dell’altro cittadino turco ostaggio di un gruppo armato sciita nella valle della Beqaa. Lo riferiscono stamani i media libanesi, che precisano che Aydin Tufan Tekin (foto) è stato consegnato ieri notte, sano e salvo, all’ambasciatore turco in Libano dalle forze di sicurezza locali. Queste ultime avevano condotto nelle ultime 48 ore raid casa per casa senza precedenti nel sud del Libano e nella periferia meridionale di Beirut, tradizionali roccaforti di Hezbollah. Solitamente le forze governative di Beirut non si spingono a condurre azioni nei territori controllati dal movimento sciita armato filo iraniano. Il 15 agosto scorso, la cosiddetta “ala militare” del clan sciita dei Miqdad, basato a Rueiss nella periferia sud della capitale, aveva rivendicato il rapimento dell’imprenditore turco e una ventina di siriani accusati di esser membri dell’Esercito libero (Esl) che in Siria resiste al regime di Bashar al Assad. Hezbollah sostiene il regime siriano che, a sua volta, accusa Turchia e Paesi arabi del Golfo di sostenere i “terroristi”, termine usato per indicare i ribelli armati dell’Esl. Sempre a metà agosto, un oscuro gruppo armato, presentatosi come Brigata Mukhtar Thaqafi (condottiero delle origini dell’Islam eletto dalla storiografia sciita a simbolo dell’eroismo contro i soprusi sunniti), aveva invece rapito nella Beqaa Abdel Bassit Aslan, camionista turco. Di lui non si hanno notizie e il quotidiano an Nahar il 12 settembre afferma che sono in corso negoziati tra autorità libanesi e miliziani sciiti. Dal canto loro, i Miqdad, che hanno smentito ogni legame diretto con Hezbollah, avevano giustificato la loro azione in risposta alla cattura, da parte di sedicenti membri dell’Esl a Damasco, di Hassan Miqdad, membro del clan libanese e presunto cecchino di Hezbollah giunto in Siria a sostegno della repressione del regime. Nei giorni scorsi, il portavoce del clan Miqdad aveva affermato che l’ostaggio turco era stato ferito da colpi di arma da fuoco durante i raid dell’esercito libanese. Nelle foto mostrate stamani dalla stampa libanese, Tekin appare in buona salute. Nei raid dell’altro ieri le forze governative libanesi avevano già liberato gli ultimi quattro ostaggi siriani rimasti in mano ai Miqdad. Mentre rimangono ostaggi dei ribelli siriani nella regione di Aleppo dieci libanesi sciiti rapiti a maggio. Per la loro liberazione, l’Esl non chiede danaro ma solo che Hezbollah e il governo libanese di cui il movimento sciita fa parte riconoscano la legittimità della “rivoluzione siriana contro la dittatura di Bashar al Assad”. Aydin Tufan Tekin, a Turkish businessman who was abducted by the Miqdad tribe in Lebanon in mid-August and freed on Tuesday, has said that he did not believe he had been freed until he saw the Turkish ambassador in Beirut. Businessman Tekin shared on Wednesday his difficult times with Anadolu Agency (AA) while he was heading to Turkey aboard plane after he was released on Tuesday. Stating that he was abducted after he got out of the airport in Beirut, “I took a cab. I was replying my emails when I heard the voice of siren. A car came in front of the cab, and its driver said something. Then I saw a man approaching the cab, with his face masked, holding a gun. I acted on impulse and put my hands up. I thought they were going to rob the driver. They forced me to get on another car, and I saw people holding kalashnikovs. After blindfolding me they took me to a house,” said Tekin. Tekin stated that the people who kidnapped him, told him several times that they were not going to kill him. “I did not know during those 27 days whether they were going to release me or not. They told me again and again that they were not going to kill me. However, how could you believe it? I was thinking all the time whether I would be freed or not. There were several scenarios for my release. There might be a military operation but it is scary. Frankly, I was afraid when I heard children playing outside with firecrackers,” said Tekin. Noting that the members of the tribe held him in an ordinary house, “I was forbidden to get close to windows at home. There was no trouble in terms of food. They told me that I was innocent, but they did not have another choice rather than keeping me,” Tekin said. He said that he was spending his time while being held hostage watching television, reading books and newspapers. Tekin stated that he was not delighted when they told him they were going to release him in two days time. “I asked myself why two days? I did not believe I was already freed until I saw the Turkish ambassador because there were many talks like that earlier. After a couple of days, they said ‘tomorrow, you are going to be a free man’. They told the same thing next morning or noon. 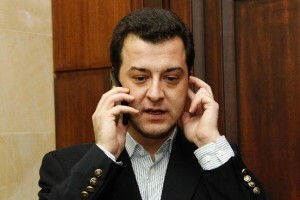 Finally they told me that I was going to be free on Tuesday evening,” Tekin said. Tekin said that the members of the tribe brought a barber to cut his hair. “They also brought my clothes, but I did not want to become so hopeful because it was a huge operation for both sides. I was aware of it. I said ‘yes’. They told me that they had been working to send him on Tuesday evening. Finally, they put me in a car, blindfolded me and drove until the half way of journey like that. Later, they handed me over to the officials of Lebanese army,” said Tekin. Noting that he was able to talk to his family after tens of days on the phone, “My family was over the moon. My mother, father and sister were delighted. It was very important for me to hear, notice the voice that you know,” said Tekin. “Life is long, it is hard to say anything at the moment. I am not the only person who deals with business in Lebanon region at my company,” said Tekin replying to a question whether he might travel to Lebanon again.